An Olympic bar weighs 44lbs/20kg, has two rotating ends which accept weight plates with a 2″/50mm hole and are 7.2ft long. These bars can usually hold as much as 540kg. 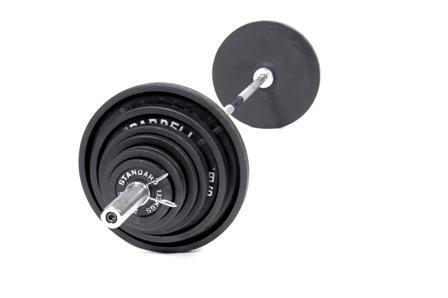 Standard weight bars vary in length and weight but are usually 1″/2.5cm in diameter thus fit weights with this diameter hole. Olympic pro’s and cons: Weight sets are usually made to a higher degree of accuracy (i.e. lower tolerances on variances to stated weights), can hold a lot of weight but are usually more expensive. Standard pro’s and cons: Standard weight sets are readily available and allow you to work at lower weights (i.e. at values under 20kg which is the weight of an empty Olympic bar). They are much weaker and lower quality than even entry level Olympic plate sets. As you may have read in power rack article the most important thing we should be looking to do is to exercise in a safe and healthy manor. Where these sets come into their own is the superior quality of the Olympic barbells. While standard bars/standard weight sets are more affordable the weight capacity of the bar is very light and usually in the region of c.100kg. Compare this to Olympic bars which can often hold 500kg and the choice becomes a no brainer. To put these numbers into context, a weight lifter is considered a “beginner” until they are able to squat 2x their bodyweight and bench roughly 1.5x their bodyweight. Most lifters will therefore run through the 100kg limit of a standard bar very quickly, particularly if they deadlift. I used a standard bar when I first started lifting at home and have now got a standard bar which is visibly bent from being loaded. Not very reassuring! If a bar was to snap you could get seriously hurt. Save yourself some time and effort and get some Olympic ones! Why do weights cost so much? Accuracy – I currently use a set of plates that are accurate to their face value, +/- 2% meaning a 20kg plate could weight between 19.6kg-20.4kg. For my uses, that’s perfectly acceptable. As the accuracy increases the price also goes up as more skill is required to get it just right. If you are concerned about what exact weight you are lifting, you can weigh each plate and use a sticker to keep track. Material – Cheaper plates are bare metal, more expensive ones have colour coded rubber coatings. Rubber helps mitigate damage to floors and other weights. For my use at home, I am happy with bare metal. I would like some rubber ones at some point though…. Shape – Stick to round weight plates. I like to have a built in handle as well to help loading/unloading. Amount of weight – I recommend a 145kg set as you get two 20kg plates which give you a much nicer height for deadlifting/power cleans than 15kg’s. How much should I pay for a set? A very tricky question to answer. Serious bodybuilders will want the best quality equipment which comes with the highest prices, for the rest of us we can settle for cheaper plates. Remember, free weights are critical when strength training so well worth investing in some now!